Today I had the gift of being one of four women, sent into the woods to discover fungi. We went wandering under the trees with laughter and delight. But let me back up to the beginning. Pear shaped puffballs growing on an elderberry stalk. Elderberry branches contain toxins, so I gave this normally edible mushroom a pass. A group of about twenty gathered for a workshop sponsored by the U.S. Forest Service. It started with a midmorning meeting; a group of all ages getting together to learn about edible mushrooms. Mind candy for an intriguing activity! Bonus! It was a warm, sunny day in September in Southeast Alaska!! We showed up for the Fungi/Lichen Gathering and Identification event in Wrangell. We broke up into smaller groups, and each group explored different areas. Our little group of four walked through the distubed soil of a short road, a stand of alder, and then coniferous woods. We started out with minor finds, mostly consisting of LBM’s - little brown mushrooms. Then we found some cool, different 'shrooms. Katherine found a beautiful big yellow amanita, and then a little button amanita that could be mistaken for a puffball. The amanita muscaria is pretty, but poisonous. One of the great variety of coral mushrooms. Some are edible and some are not, and it is very difficult to tell the difference. The best part, though, was that we snuck through a fence. It was an old and abandoned fence, but that didn't matter. We had a knowingness that we would find the good stuff because Donna found a spot for us to pull back the fence, crouch down, and slip through like kids escaping the bounds of the schoolyard. Immersed in the wonderment of childhood and the laughter of womanhood, the mushroom hunting got even better. Back in the woods there were pretty white mushrooms of the Clitocybe persuasion, yellow-foot (Cantharellus tubaeformis) with their fluted caps, and frilly coral mushrooms (varieties of Ramaria) in the moss of the forest floor. Our assignment was to collect interesting specimens and bring them back to the picnic tables. Kate Mohatt, mycologist and Chugach National Forest ecologist, looking over a table of mushrooms with workshop participants. The tables filled with a visual feast of fungi as each group returned with their finds. The mushrooms were loosely sorted into three categories: gilled mushrooms with dark spores, gilled mushrooms with light spores, and mushrooms without gills. Some were edible and many were not. Isn't Shoemaker Park a beautiful location? Kate Mohatt discussing the merits of golden chanterelles and hedgehog mushrooms for dinner. Kate Mohatt, a mycologist, and a Chugach National Forest ecologist, spoke about identifying different species. A few mushrooms are identifiable at a glance, and other species can only be teased apart by working with a microscope or by doing genetic testing. In between those two extremes are hundreds of mushrooms that are identified using detailed descriptions and spore color. Kate clued us in to details concerning edibility of many of the species. 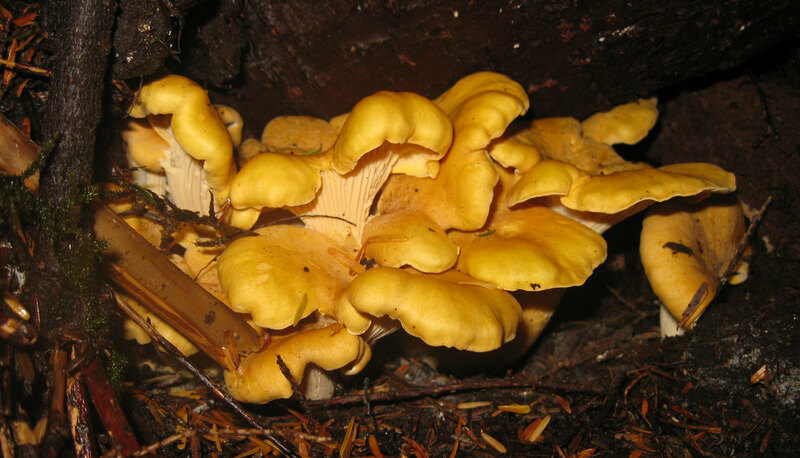 She also shared her five top favorites for the dinner table: belly button hedgehog (Hydnum umbilicatum), bears head (Hericium abietis), king bolete (Boletus edulis), golden chanterelle (Cantharellus formosus), and hedgehog (Hydnum repandum), but not necessarily in that order. She even knows lots of the mushrooms by their Latin names. Yep, right off the top of her head. Amazing. The whole group did find a good variety of edible mushrooms, and some that are particularly delectable. They were harvested away from busy roads and other sources of pollutants. Mushrooms can take up contaminants, like lawn chemicals, that no one wants to eat. Angel wings (Pleurocybella porrigens) are edible in moderation by people who do not have kidney trouble. Kate suggested that we stick to eating clearly identifiable mushrooms that are proven to be edible, rather than fool around with mushrooms that are questionable. Being a mycologist, she had great information on mushrooms like angel wings that should only be eaten in moderation, and not at all by a person who has kidney issues. She noted that new research has changed the edibility recommendations on some mushrooms. The alcohol inky cap (Coprinus atramentarius), for example, used to be considered an edible, but now is not recommended. She also noted that all mushrooms, including the grocery store varieties, should be cooked prior to being eaten. Karen Dillman (center) is a lichen expert and a Tongass National Forest ecologist . She is discussing good edibles with Elody while Katherine studies the non-edible Amanitas on the table. Karen Dillman, a lichen expert and Tongass National Forest ecologist, shared some of her expertise in using mushrooms for dyeing wool and silk. She was happy to see a Dermocybe phoenicea brought to the table. It is a small mushroom that will dye wool a deep red if used with the correct mordant. Other dye mushrooms found today included the dyer’s polypore (Phaeolus schweinitzii), the fragrant hydnellum (Hydnellum suaveolens), and Dermocybe semisanguinea. The Dyer's polypore (Hydnellum suaveolens) dyes wool yellows, golds, and orange. It was a fun and interesting workshop! A giahugical (that's really big) thank-you to Kate and Karen for coming to Wrangell to teach us more about mushrooms in Southeast Alaska! Thank you Donna, for finding the place to sneak through the fence, and for coaxing all of us to enjoy our inner child. Thank you Carrie, for being the responsible one; checking time and location for all of us, while being the essence of light and laughter. Chicken of the woods (Laetiporus conifericola) is edible when young and tender. Thank you Katherine, for your infectious delight in the world, and for your beautiful laugh rippling through the forest. And to all of you, my friends all over the world, grab a few of your near-and-dears, and go have a blast exploring the wilds! There is not enough information in this site to identify mushroom species. This site is not intended to identify mushrooms, or suggest that you use or eat them. This is merely an introduction. If you are curious about mushrooms please find good tools to learn more about them! Golden chanterelles (Cantharellus cibarius) found hiding under a big root. This is a delicious edible! Mushroom photos from other days have been included for illustration.